Knowing the competitive landscape is critical to staging a successful ad campaign, but it's often difficult to understand which competitors’ ads appear before yours, and why. Furthermore, deciding what actions you should take to stay ahead can be daunting. 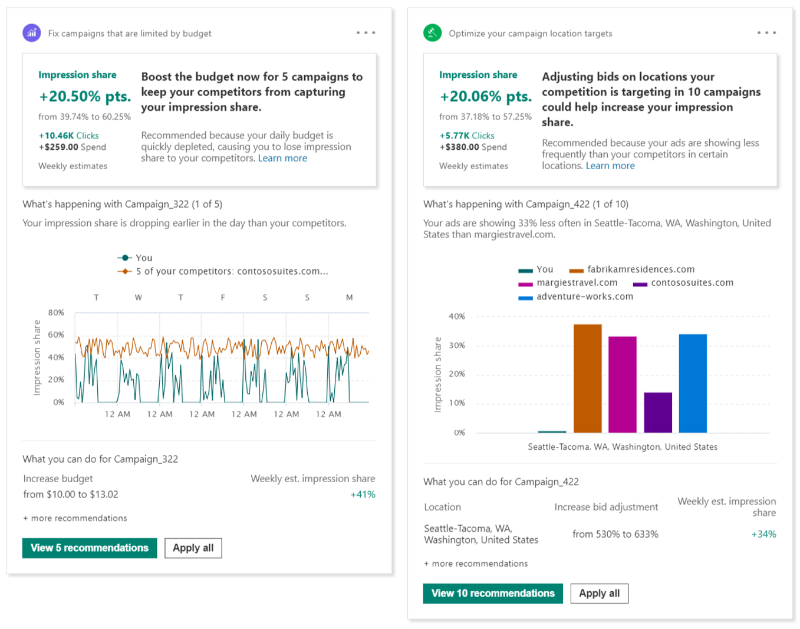 With our new Competition tab—now available globally—Bing Ads helps you quickly get valuable insights on these competitors. We also do analysis using machine learning to find areas of opportunity within your campaigns and recommend optimizations you can implement. This will help you save time and become more confident about the decisions you're making for your business. The competition tab has two sections. The first section is Auction Insights. 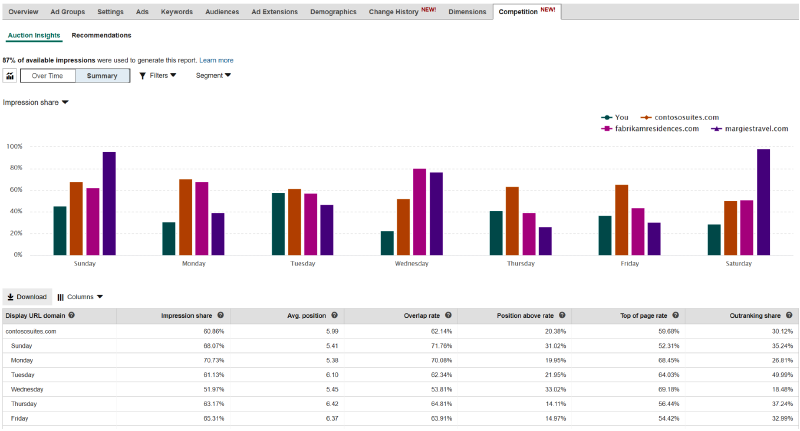 We took the Auction Insights report and completely revamped it with richer visualizations, including the ability to segment the data using metrics such as time or device, as well as filter down to specific competitors or campaigns. Let’s say you're managing ad campaigns for a tour and travel company. With the Over Time view, you can instantly understand the competitive trend. For example, in the chart below, you can see that your top competitor used to be contososuites.com but recently fabrikamresidences.com has gained some steam. You can also see that a new competitor (margiestravel.com) popped up out of nowhere and is getting around 98% impression share. 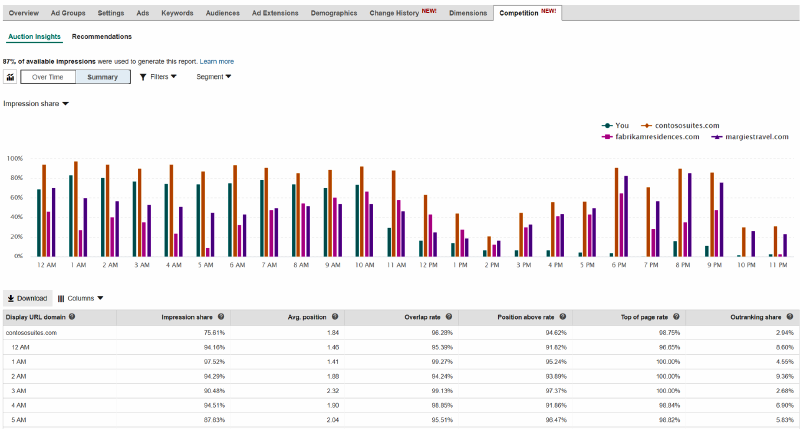 You can drill down to see where exactly your ads are showing by segmenting the data by device type. By segmenting the data by day of the week, you can quickly see that your competition is beating you with significant margin almost every day of the week except for Tuesdays, where the race is close. You can even slice the data by hour of the day to optimize your campaigns at a more granular level. If you want to see data only for specific competitors, simply filter on the domains in which you're interested. Want to focus on specific campaigns or ad groups? 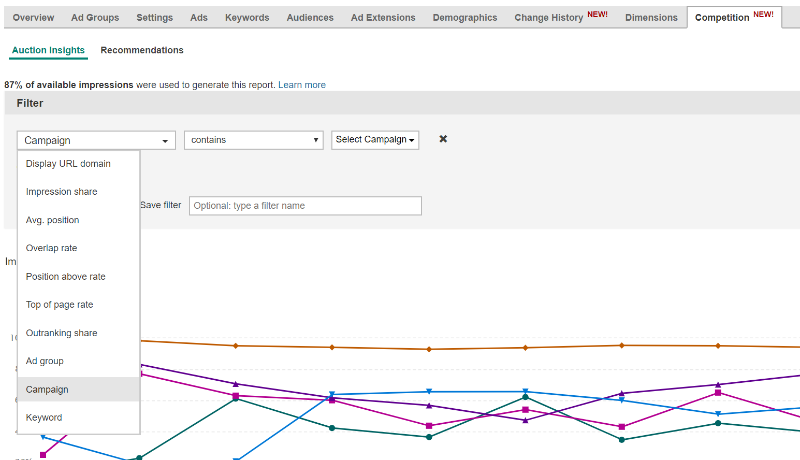 You can easily filter on specific campaigns or ad groups. Helpful hint: To see Auction Insights data for a specific set of keywords, go to the Keywords tab, select the keywords that you're interested in, then go to Details, then Auction Insights, then Selected. Now that you've done some analysis in the Auction Insights section, the next question is: What action should you should take? 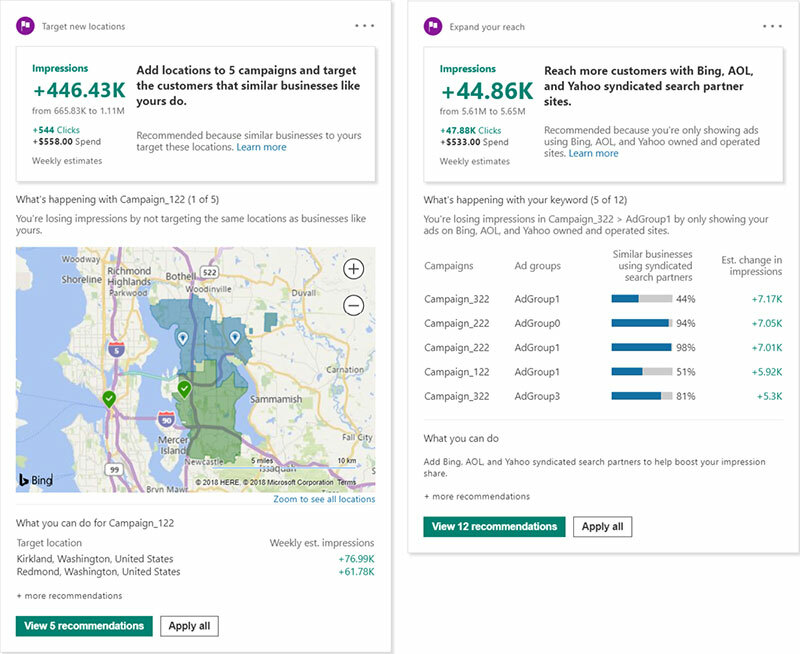 This is when the Recommendations section comes in, where Bing Ads uses machine learning to find aspects of your campaigns that you can adjust to help stay ahead of the competition. 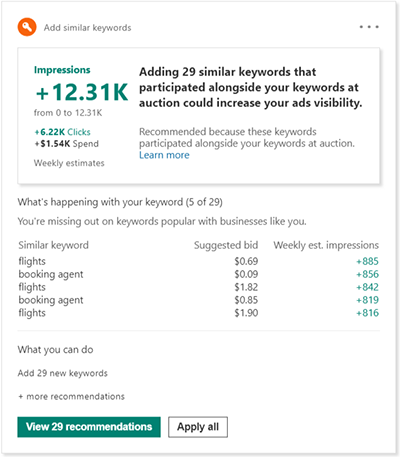 For each recommendation, Bing Ads presents insights on What's happening and What you can do—and we let you know what outcome you can expect. We're excited to roll out these new AI-powered capabilities and we hope you find them valuable in growing your business. 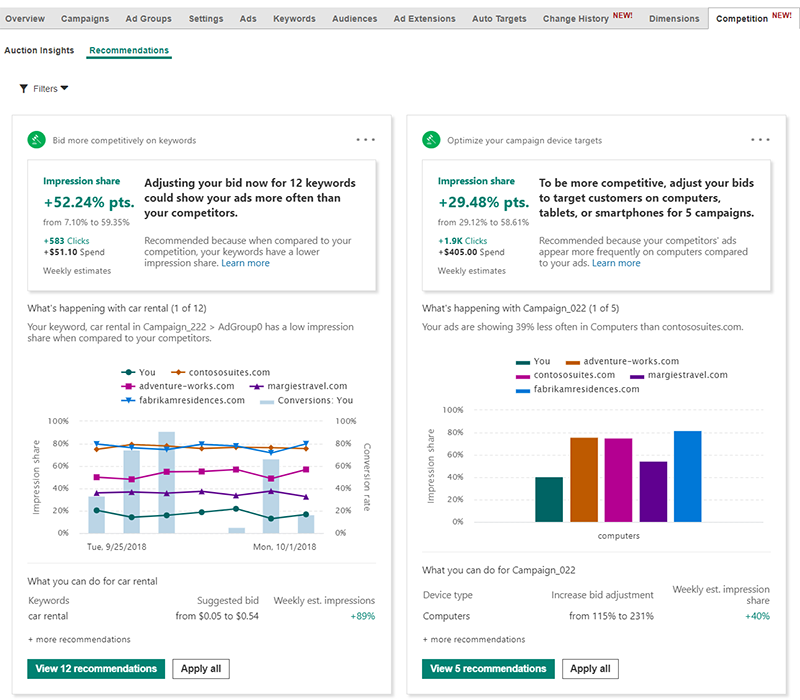 Explore the Competition tab and see what it can do to help you keep your business ahead of the pack. For any questions or feedback on this new feature, we encourage you to reach out to your Bing Ads account manager. You can also ping us on Twitter, suggest a feature on the Bing Ads Feature Suggestion Forum, or send your thoughts to bingads-feedback@microsoft.com.